After completing the Armor Officer’s Basic Course, where he made the Commandant’s List, Hanson was commissioned an Army Armor officer in 2000 as platoon leader with Task Force 1-64 Armor, Camp Dobol, Bosnia-Herzegovina. Returning stateside, he served as a tank platoon leader with Company A, 1st Battalion, 64th Armor, at Fort Stewart, Georgia. From 2002 to 2003, he served as the executive officer of Troop F and Headquarters and Headquarters Troop, 1st Squadron, 16th Cavalry Regiment, Fort Knox, Kentucky. After serving as 1st Squadron’s adjutant, he was promoted to captain in 2003, and assumed duties as the regimental adjutant in 2004. Hanson then completed the Armor Captain’s Career Course, where he made the Commandant’s List for a second time. Deployed in 2005 to Headquarters Multi-National Force – Iraq as a liaison officer in the Iraqi Prime Minister’s Situation Room, Hanson soon took command of the 16th Cavalry Regiment’s Headquarters and Headquarters Troop. 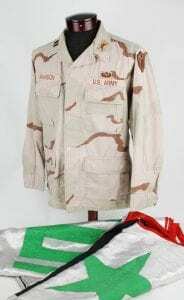 Hanson wore this jacket while serving as a liaison officer to the Iraqi Prime Minister’s Situation Room as a part of Headquarters, Multi-National Force-Iraq. This flag was flown over the office of the Iraqi Prime Minister from November 2005 to January 2006. Hanson was presented with it the day before he left Iraq by his Iraqi colleagues in the Iraqi Prime Minister’s Situation Room, which is adjacent to the Prime Minster’s Office in the Green Zone of Baghdad. With more than six years of service, Hanson joined the Wisconsin Army National Guard in 2007. He served as the adjutant of 1st Squadron, 105th Cavalry, and took command of Troop B, 1st Squadron, 105th Cavalry (Watertown, Wisconsin) in November 2007. 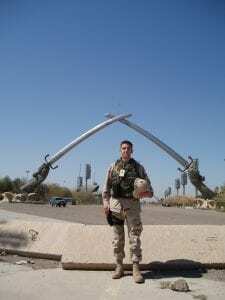 The unit deployed in 2009 as part of Operation Iraqi Freedom, conducting a security and base defense mission at Forward Operating Base Cropper, in Baghdad. Hanson’s awards and decorations include the Bronze Star, the Defense Meritorious Service Medal, the Army Commendation Medal with two oak leaf clusters, the Army Achievement Medal with one oak leaf cluster, the Armed Forces Reserve Component Achievement Medal, the National Defense Service Medal, the Armed Forces Expeditionary Service Medal, the Iraq Campaign Medal with two Campaign Stars, the Global War on Terrorism Service Medal, the Armed Forces Reserve Medal with Mobilization “M” Device, and the NATO Medal. He has also earned the Parachutist Badge, the German Army Proficiency Badge (in Gold), and the German Army Marksmanship Badge (in Gold). Hanson is a spur holder and recipient of the U.S. Armor Association’s Honorable Order of St. George (Bronze Medallion). He is also a member of the Order of Kentucky Colonels. Hanson is now a circuit court judge in Rock County. He is a proud father of three children and married to Dr. Susan M. Hanson, a lecturer in biology at Carroll University in Waukesha.